The eight driver W80 makes no compromises delivering reference level audio by integrating full-size dual bass drivers with dual mid and quad high drivers. 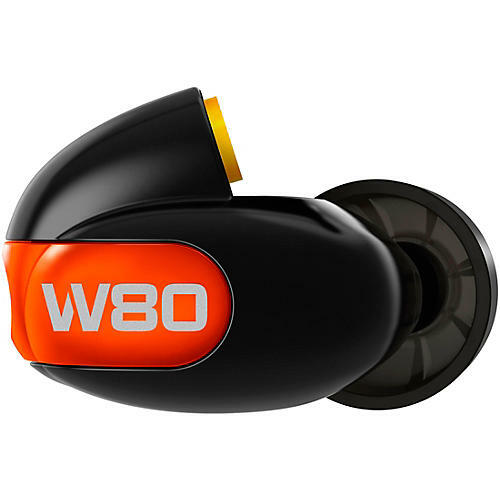 The result is an exceptional delivery of extended range and harmonic content that has never been heard in a multi-driver earphone—until the arrival of the W80. 60 years of experience designing products for the ear, has resulted in a universal-fit earpiece that is compact, low-prole, lightweight, and extremely comfortable. Westone's proprietary eartips enhance the performance of the W80 by ensuring a great fit and seal, right out of the box. Westone’s proprietary balanced-armature drivers provide enhanced sonic detail and frequency range that extends well beyond other in-ear solutions. Powered by Qualcomm aptX HD audio, Westone’s Bluetooth V2 cable is designed for music lovers, and tuned to deliver high-resolution audio for a truly amazing wireless listening experience. Featuring Westone's exclusive MMCX Audio connectors with formed earhooks, Westone’s Bluetooth Cable V2 is compatible with all Westone in-ear monitors and earphones. Enjoy listening to music and taking calls even longer with our new portable charging dock that extends battery life up to twelve hours between charges.